5 January 2017. Digital Life Alliance, a consortium of enterprises applying advanced technologies to health and medicine that plans to offer personalized solutions, is expanding to 7 members, as well as iCarbonX, the company that founded the network. iCarbonX in Shenzhen, China is also investing some $400 million in the Digital Life Alliance member companies. Digital Life Alliance and iCarbonX plan to apply technologies from the member companies including genomic sequencing, artificial intelligence, immunology, microbiomics, protein chemistry, digital imaging, and automated health records to develop a personalized guide to healthy living. The goal of the alliance, says iCarbonX, is to combine patient-generated genetic and biological data with genomic sequencing and artificial intelligence to detect meaningful signals on health, disease, and aging. iCarbonX was founded in October 2015 by genomics company executive Jun Wang, who has a Ph.D. in bioinformatics and is specialist in artificial intelligence. The company, through the Digital Life Alliance plans to offer a personal guide for living well, called Digital Me, that merges and synthesizes the offerings of the member enterprises. iCarbonX also unveiled today its platform for integrating the technologies, known as Meum, from which personalized health reports are expected to emerge. – PatientsLikeMe in Cambridge, Massachusetts, a network and community of more than 500,000 individuals that acts as a repository of medical data, a source of clinical trial participants, and an advocate for patients. – SomaLogic in Boulder, Colorado, with a technology that measures protein activity in real time. iCarbonX and SomaLogic are also establishing a joint venture to provide SomaLogic’s proteomics tests for the Chinese market. – HealthTell in San Ramon, California that measures antibody levels in the immune system with blood tests to predict drug response and detect the presence of disease. – AOBiome in Cambridge, Massachusetts, producing probiotic-based therapeutics to restore ammonia oxidizing bacteria to the human skin microbome. As part of the alliance, AOBiome is expected to develop its first personalized formulations. – GALT — short for General Automation Lab Technologies — in San Francisco, that applies high-throughput genomic sequencing to microbial biology, but also combines related technologies including chemistry, robotics, optics, microfabrication, and information technology. GALT plans to apply its technology to personalized assessments of the human microbiome. – Imagu Vision Technologies in Tel Aviv, Israel that applies artificial intelligence to digital imaging to create a digital human model for personal quantitative health decisions. iCarbonX acquired Imagu in September 2016 and is establishing an artificial intelligence research and development center in Israel. – Robustnique Corp., a developer of synthetic enzymes and high-end cosmetics in China. iCarbonX says the company is investing nearly $400 million in the alliance companies. 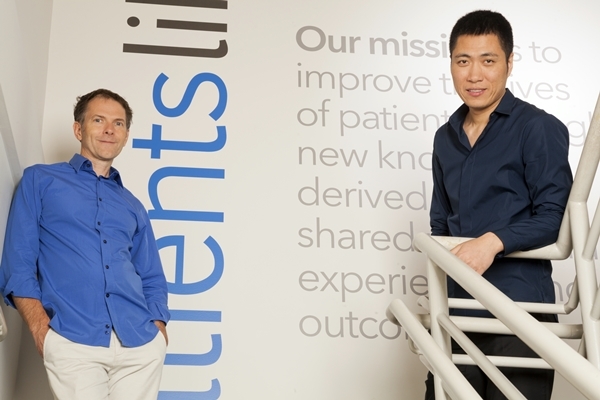 PatientsLikeMe notes iCarbonX is taking a minority equity stake in its enterprise, and combined with current investor Invus LP, will make an investment in excess of $100 million. AOBiome adds that iCarbonX is making a $30 million equity investment in its company.